Having a quiet moment for some intimate conversation with the Lord is a wonderful way to pray. It’s an opportunity to share your thoughts and feelings with Him; to thank Him for His blessings; to listen to His guidance; and to express your love for Him. And praying with others also can be very comforting. 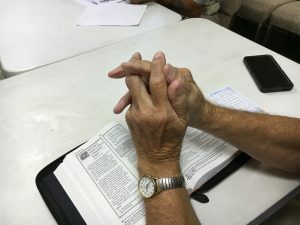 As a group, you are submitting your hearts to Jesus collectively as you pray for your families, your church, your community, and, yes, yourselves. That’s why the Prayer Team at Christ Worship Center invites you to join us as we visit with the Lord. 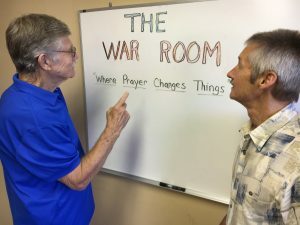 We meet each Sunday morning at 9:30 in the “War Room” by the church’s front entrance. (The room is named after the 2015 movie that promotes the idea of dedicating such a room solely to prayer, as a way of battling back the evil plans and intentions of sin). Please feel free to come pray aloud with us – or simply sit and enjoy the loving power of God. In such a setting, the Holy Spirit is covering all of us, and guiding us.